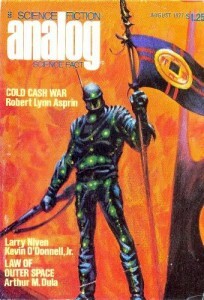 Description: Before Ender’s Game was written as a novel, it was published in the August 1977 issue of Analog Magazine as short story. This original publication includes 35 pages of text and black and white pictures. There are some notable changes form the novel version of Ender’s Game. For example, Ender’s last name is given as both “Wiggin” and “Wiggins” in this novelette version.